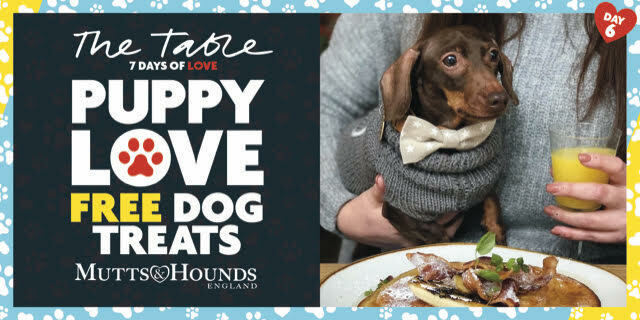 Head down to the The Table Café Puppy Love Event on 16th February to get your paws on some yummy treats as part of the The Table Café’s 7 Days of Love campaign from 11-17 February 2019. Table Café Puppy Love: Day 6 of The Table Café’s 7 Days of Love campaign – The first ten dogs to visit The Table Café on Saturday 16th February will receive a FREE bag of Mutts & Hounds all-natural dog biscuit bakes (worth £8.99). T&Cs: Valid on Saturday 16th Feb 2019 only. Available when their human purchases a main meal. A maximum of four large dogs inside and 8 small dogs. No limit on the outside terrace area. Booking recommended to avoid disappointment. Event text and image courtesy of the event organiser featuring Pops Sausage.